Peafowls, peacocks, peahens, peachicks. They're all peas that have feathers instead of emerging from pods. The terms become confusing when people use them interchangeably. Each term applies to a species of birds in the Phasianidae family. "Peafowl" is the general name for the family of birds. 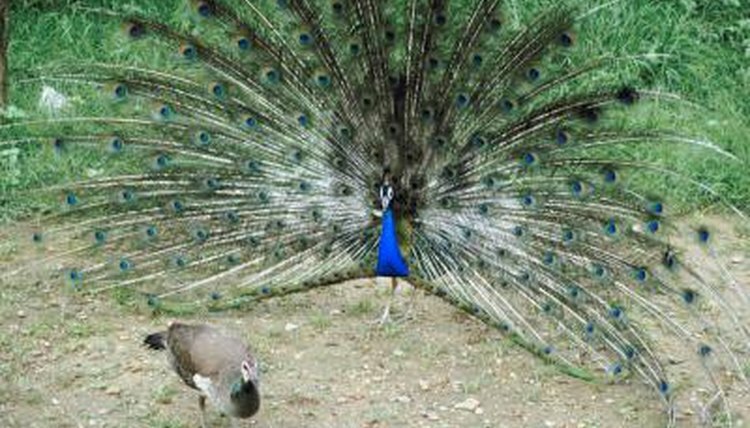 A peacock is a male peafowl. A peahen is a female peafowl. The young of a peacock and a peahen are called peachicks. Peafowl are in the taxonomic order Galliformes, which includes chickens, pheasants and other full-bodied, ground feeders. The Phasianidae family contains three species of peafowl: the Indian or blue peafowl (Pavo cristatus), the Java green (Pavo muticus), and a species found only in Africa, the Congo peafowl (Afropaco congensis). The Indian peafowl is native to India, Pakistan and Sri Lanka; Java greens roam Southeast Asia. Most people encounter the Indian species. The male peafowl, the peacock, is best known for his head crest and amazing tail called a train. The train with its ocelli, or eyes, comes into its full splendor when the peacock is about 2 years old. With a wingspan of nearly 5 feet and a train just as long, the male peafowl is "one of the largest flying birds in the world," according to the Smithsonian's National Zoological Park. Peahens, female peafowl, are mostly brown with a white belly, a green neck and the same type of head crest. Peafowl are polygamus. The peahen mates, then goes off to lay eggs and raise her offspring alone. Peachicks are precocial -- covered in down and with open eyes -- at hatching. They can leave the nest in about two days. Research has shown that peahens who mate with elaborately tailed peacocks produce more male offspring. Some researchers argued that Afropavo congensis was more closely related to the partridge. DNA analysis confirmed otherwise. The Congo peafowl and its Asian counterparts are related, despite the geographical distance and different appearances. Congo peafowl are smaller. The Congo peacock has a shorter tail and no ocelli. The male is dark blue with metallic green and purple accents, and a reddish throat. The Congo peahen is metallic green with chestnut-colored head and underparts. What Is a Group of Peacocks Called? Do Pea Hens Lay Eggs Daily? What Is the Difference Between a Peacock & a Pheasant? What Kind of Nests Do Peacocks Build? What Is the Behavior of a Peacock?